Social Shopping is the new wave of ecommerce that far expands the limitations of traditional commerce websites. 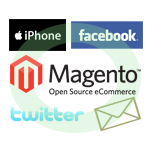 Our skilled team of developers here at Juno Web Design now only code using the open source eCommerce platform Magento. Trends have shown that Magento is now over three times more popular than any other ecommerce platform – click here to see the latest shopping cart trend statistics from Google. Being open-source software, Magento is free to use and is updated regularly with new features and more efficient inner workings. Products can be easily managed by clients themselves with simple stock systems and a CMS environment to add descriptions, products, news posts etc. To find out more about social marketing and SEO call the Juno group now on 0845 544 1766 and see how we can propel your business online and within the latest social shopping circles. We are part of the Juno Media group, four interlinked companies that take raw products and elevate them on a splendidly branded, easy-to-use ecommerce platform. From day one the website is set to perform well in the search engines and convert visitors into customers.